The best hiking trails around the Chapel of the Madonna di Vitaleta, exploring the Val d'Orcia between Pienza and San Quirico d'Orcia, only an hour drive north of Podere Santa Pia. Podere Santa Pia is an authentic holiday home in one of the most beautiful regions of Tuscany, the Maremma. Hikers have long been familiar with the house and its pristine environment. Maps and guides are widely available and guarantee comfort and a deeper insight into the Tuscan landscape. We searched for the seven most beautiful walks in the surroundings of the Capella di Vitaleta. The Val d'Orcia is located north of Podere Santa Pia and is easily accessible either from the abbey of Sant'Antimo and Montalcino or along the western flank of Monte Amiata, crossing communities of Seggiano, Castiglione d'Orcia and Pienza. One of the most photographed churches in Tuscany, this mystical building used to be the home of a Renaissance statue of the Madonna, a sculpture by Andrea della Robbia in 1590, now housed in a church in San Quirico d'Orcia. The small chapel lies in the rolling hills between Pienza and San Quirico d'Orcia. We selected the best hikes towards the chapel, starting either from Pienza or San Quirico d'Orcia and propose some good restaurants both in Pienza and in San Quirico d'Orcia. Immerse yourself in the beauty of the Val d'Orcia. Follow one of these easy trails and take your own pictures of the stunning Vitaleta Chapel! The Capella della Madonna di Vitaleta, with its cypresses and old podere, is one of the most photographed places in Tuscany. The walk from Pienza to the chapel runs through a beautiful part of the Val d'Orcia. On the way back you walk along Podere Terrapille and the famous road with cypress trees where some of Gladiator's scenes were recorded, and further along the Pieve di Corsignano, a jewel of Romanesque architecture. We can park our car in the surroundings of Piazza Dante Alighieri. This is an extended version of the previous walk. This itinerary can start by entering the historical center of Pienza through the gateway called the Porta al Prato. After an brief exploratory tour through Pienza (starting at the Porta al Prato), enjoying the unchanged medieval centre, we leave Pienza through the Porta del Santo (on the left of the Duomo) and walk down, in the direction of Bandita Selvoli, a strongly eroded piece of land near Podere Selvoli. These are the biancane that are so characteristic of the Crete Senesi, but which occur throughout the Val d'Orcia as well. Halfway we walk over the Strada Provincial della Val d'Orcia, the river is on your left. After about 1.5 kilometers you turn right into a strada bianca or dirt road, and immediately left again, and walk in the direction of Podere Commenda and on to the Capella Vitaleta. 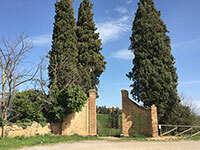 We can park our car in the surroundings of Piazza Dante Alighieri, and enter Pienza through Porta al Prato. We start this walk with a brief exploration of the alleys of Pienza, starting at Largo Roma and entering Pienza along the Via dell'Apertura. Walk into Via dell'Apertura and almost immediately turn left onto Via Case Nuove and enter a pleasant square. There is a good ice cream parlor, Buon Gusto Gelateria (Via delle Case Nuove, 26), and at number 7 Caffè della Volpe. Nice walk in the breathtaking panoramic countryside setting of Ridley Scott’s Gladiator. You walk in the footsteps of Russell Crowe returning home. A similar trail, with a different and shorter stretch in Pienza is the walk, Annello Pienza - Capella di Vitaleta | 10,26 km. 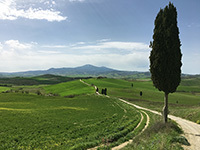 This is a similar trail, but once you have reached the Capella di Vitaleta, we continuie to San Quirico d'Orcia, to explore the secend Tuscan scenery of Gladiator, the cypress lane in front of Villa Poggio Manzuolo, near San Quirico dOrcia. A beautiful, but a long walk in the overwhelming landscape of the Val d'Orcia. Halfway you suddenly come face to face with the Cappella di Vitaleta. 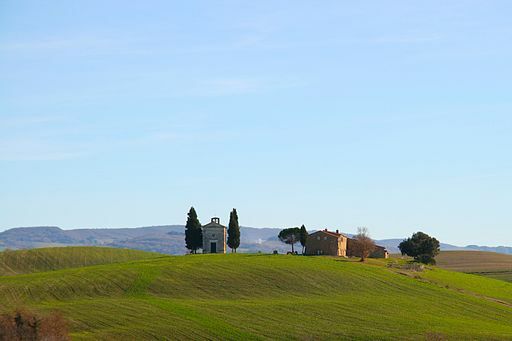 This small chapel with a few cypresses is one of the iconic images of Tuscany. Furthermore you walk along the banks of the Orcia to Bagno Vignoni, a spa with thermal baths that have Roman origins. On the way back we also walk along the biancane Bandite Selvio, a striking piece of nature characterized by biancane and calanchi. 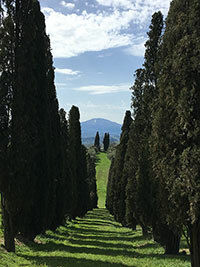 A nice walk that runs from San Quirico d'Orcia to Pienza. Be sure to take a moment to explore San Quirico d'Orcia. This is one of the most beautiful towns in the Val d'Orcia.There are two churches and Renaissance gardens that you can not post. The main street of San Quirico d'Orcia, Via Dante Alighieri runs from Piazza IV Novembre to the Duomo, the Collegiata dei Santi Quirico e Giulitta. Halfway is at the Piazza della Libertà, the Chiesa di San Francesco. This church, built on the old San Francesco monastery, is also called the Chiesa della Madonna di Vitaleta, because here the Madonna of Andrea Della Robbia is kept. The image in glazed porcelain is on the main altar. Halfway through our walk to Pienza, the Capella Vialeta is a nice stop for a photo session. Here used to be the statue of Andrea della Robbia's Madonna, a glazed terracotta sculpture. The only frazione of Pienza is Monticchiello. The neighboring municipalities of Pienza are Castiglione d'Orcia, Chianciano Terme, Montalcino, Montepulciano, Radicofani, San Quirico d'Orcia, Sarteano, Torrita di Siena and Trequanda. Museo diocesano, corso Il Rossellino, 30 - Pienza (Siena). Openingsuren : van midden maart tot oktober, woensdag-maandag, van 10.00-13.00 en 15.00-19.00; dinsdag gesloten; van november tot midden maart, zaterdag en zondag, van 10.00-13.00 en 15.00-18.00; gesloten op dinsdag. Photo by Raffaele pagani, licensed under the Creative Commons Attribution-Share Alike 4.0 International license. Simple and inexpensive osteria on a quiet, pleasant square, the Piazza di Spagna in the center of Pienza. For a more extensive list of good restaurants and addresses for pecorino and other specialties, read also Some of the best Restaurants and food addresses in Siena (NED).